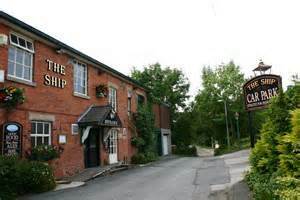 The Ship Inn is reputed to be more than three centuries old. As well as once being a smuggler’s watering-hole, it also harboured a skull which had its home in the attic of the building. Like other such skulls, it was said locally that it should never be moved or disaster would result. The owners of the pub in the mid-1990s were well aware of the warnings but, one day, the skull was found to have disappeared from its home. This fact was only discovered the day after a restaurant employee saw two ghosts. Two people wearing ‘white silk bloomers and red shirts’ were seen by the female employee, who said they were apparently deep in conversation. The pub and restaurant had just closed after lunchtime and the people were in the room where kitchen utensils were stored, so she assumed that the oddly-dressed people must have been taking part in some sort of fancy dress affair and had unwittingly been locked in. Thinking they must be hunting for a way out, she had a quick word with her manager, who immediately went into the room and found no-one. There had been no fancy dress event in the pub that day. This entry was posted in Ghosts, Hotels & Pubs, Skulls and tagged Freckleton, ghost, Haunted Pubs, Skull. Bookmark the permalink. The ghost at the ship are connected with another ghostly presence at a cottage on Preston old road. This presence in the cottage is of a river raider, they signal from the ship inn when a merchant ship would pass and the raiders would do their business as they reach the cottage. The presence in the cottage is said to have feelings about who lives in the cottage . If he does not like you , he will make you feel uncomfortable, however if he likes you, you will always feel safe and at home. What a lovely connection. The landlady of the pub who told me about the ghost was evidently unaware of that link so thanks for letting me know! That’s OK , i babysat in the cottage for 4 years, Also my dad was a bit of a local historian, with ghost, witches and local folklore.